Our Rochelle 6 drawer bombe style tallboy is finished to order in the UK in the colour of your choice and offers plenty of useful storage space. Shown here in Distressed Noir black it can also be finished in Silver, Gold, Antique White or any other colour of your choosing - with or without distressing. You may also select different knobs or handles. The price shown is for a painted finish and for the handles shown. Different colours and handles may require a price adjustment - please contact us for a quote. Complementary pieces can be found in our Rochelle Collection. Dimensions in cm: 60W x 48D x 140H or to your own specifications. 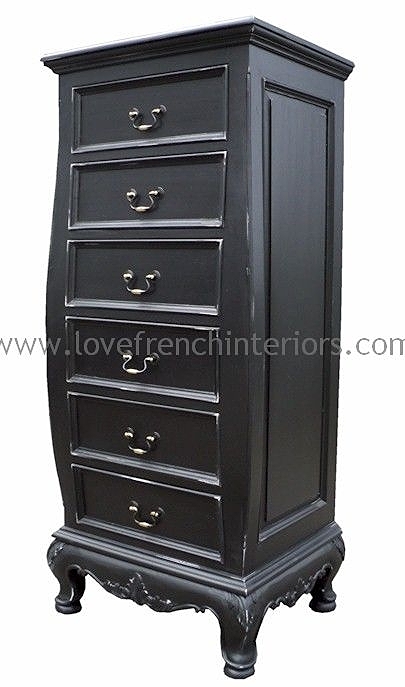 Colour/Finish: Shown here in Distressed Noir Black but it can be finished in the colour of your choice!